В 1913 году на венской фирме Якоба Лёнера был разработан двухместный биплан "В" со 120-сильным мотором "Австро-Даймлер" и оригинальными стреловидными крыльями, повышавшими, по замыслу авторов, продольную и поперечную устойчивость машины. На следующий год его приняли на вооружение австро-венгерской военной авиации, присвоив обозначение В-l. При этом вначале каждая построенная машина, подобно боевому кораблю, имела собственное имя, начинавшееся с буквы "Б" ("Бригант", "Барбара", "Будда", "Бригитта" и т.д.). B-II - двигатель "Геро", 85 л.с., руль поворота с роговой аэродинамической компенсацией. Самолет в основном использовался как учебный. B-IV - двигатель "Мерседес", 100 л.с., шасси без противокапотажной лыжи, на некоторые экземпляры ставили подвижный пулемет в задней кабине. Энерговооруженность этой машины оказалась недостаточной для фронтового использования. Плохая скороподъемность и низкий потолок, не превышавший в жаркие дни 2000 метров, обусловили быстрый перевод B-IV в учебные подразделения. B-VI - мотор "Рапп", 145 л.с. B-VII - двигатель "Австро-Даймлер", 150 л.с. С-I - двигатель "Австро-Даймлер", 160 л.с., уменьшен размах и упрощена структура крыльев. Стрелковое: начиная с модификации B-VI на большинство самолетов ставили турельный пулемет "Шварцлозе". LOHNER-DAIMLER. This firm is now amalgamated with Etrich. Motor............h.p. 60 Aust. 125 Aust. Messrs. Jacob Lohner and Co. is an Austrian firm with works at Vienna, where they produce Etrich monoplanes and machines of their own design. They are entering a tractor biplane, known over there as the Arrow-Plane Dreadnought, equipped with a 120-h.p. Austro-Daimler motor. It was on an identical machine that Lieut. Von Blaschke broke the world's altitude record with passengers at the Vienna flying meeting last month by taking two besides himself up to 3,500 metres, and by taking one single passenger to a height of 4,260 metres. Lieut. Von Blaschke himself is probably going to fly the machine at the competitions at Salisbury. THE MILITARY COMPETITION - THE MACHINES. 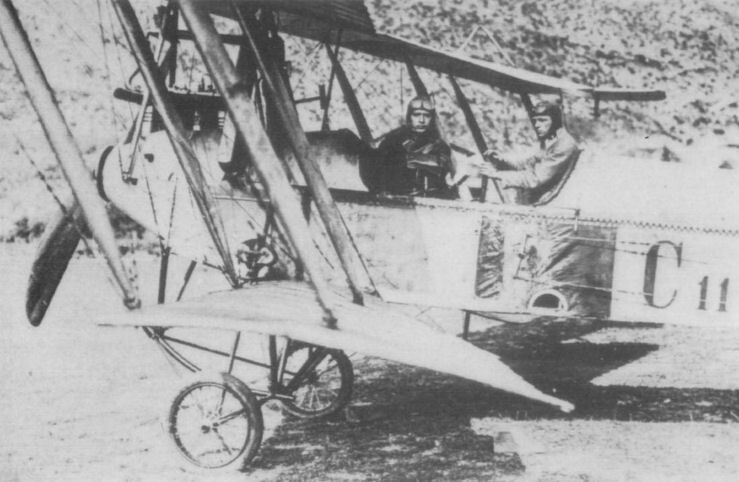 THE LOHNER ARROWPLANE DREADNOUGHT (ARMY TYPE). THIS interesting entrant from Germany is termed "Arrow-plane" from the fact that, when flying overhead, its silhouette resembles closely the form of an arrow. Its wings, set back Dunne fashion, might be the arrow's head, its fuselage the shaft. Of the machine, two main types are made at the Vienna works of Messrs. Jacob Lohner and Co. - an "Army type " and a "Navy type." They may readily be distinguished from one another, in that the Army type has a direct coupled tractor; the tractor of the Navy type is centred some distance above the motor, and withal, geared down. It is a biplane of the former type that will be flown in the Military Competition at Salisbury. To Lieut, von Blaschke will be entrusted the piloting. Besides the photographs we print, we have been able to glean from Mr. Cecil E. Kny, who represents the manufacturers here in England, a few details. The upper plane spans nearly 53 ft., and by virtue of its shape is designed to give the machine an excellent modicum of stability - both in a lateral and longitudinal sense. Its large span, however, does not make it too unwieldly for military service, for the extensions of the top plane, each 10 ft. in length, may be folded down, allowing the biplane to be conveniently housed in a shed just over 33 ft. wide. An entirely covered-in streamline fuselage forms the backbone of the machine. In it are located the three that the machine is designed to carry - the mechanic directly behind the motor (a 120-h.p. Austro-Daimler), and the pilot and observer-passenger some distance behind the planes, where their view is clearest. The fuel tanks are arranged between. Terminating the fuselage is the tail, the shape and general arrangement of which can be gathered from our photographs. 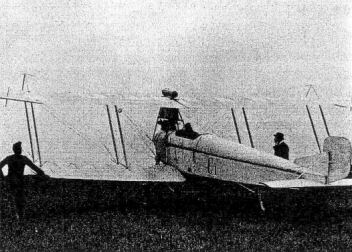 Like the greater part of German machines, it is provided with a land brake at the tail to decelerate it quickly on landing. In addition to its abilities for climbing - the machine holds world's records in passenger altitude, as we recalled last week - it has a very excellent gliding angle. For a biplane its speed is unusually high. It is estimated to average 70 m.p.h. 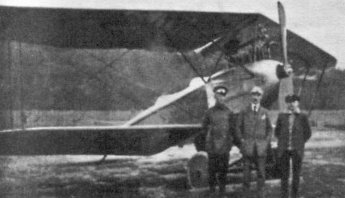 "Лёнер" B-VII, 17 эскадрилья ВВС Австро-Венгрии, август 1915г. THE MILITARY COMPETITION MACHINES. 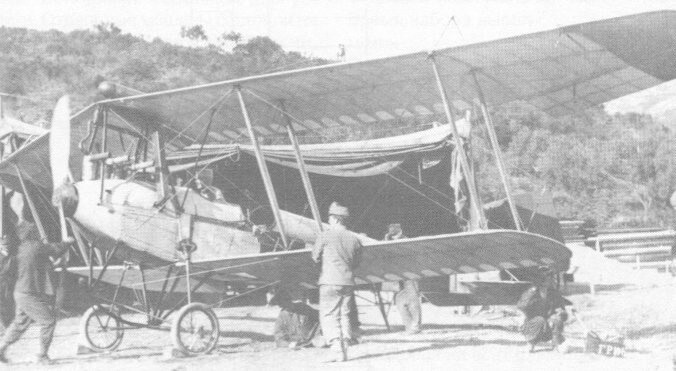 - Three-quarter front view of the Arrow-plane Dreadnought, the biplane entered by Messrs. Jacob Lohner and Co., of Vienna. It is rumoured that great things may be expected of this machine. THE MILITARY COMPETITION MACHINES. - Rear view of the Arrow-plane Dreadnought, the biplane entered by Messrs. Jacob Lohner and Co., of Vienna. The Austro-Hungarian units were a little better equipped but relied on German-supplied machines plus those that were licence-built in Austria. 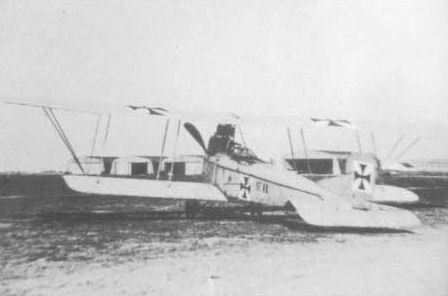 This Lohner B.ll of Fliegerkompanie 6 is at Igalo in mid 1915. 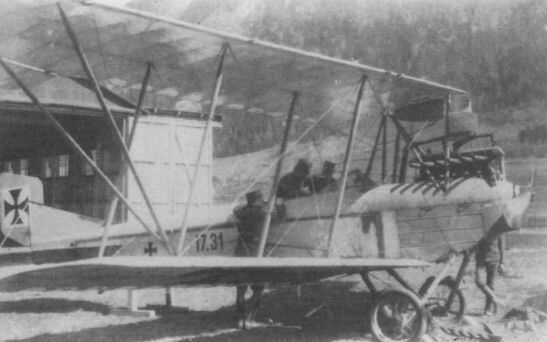 Lohner of Austria, besides producing their admirable line of small, agile flying boats, also built a series of land-based, reconnaissance two-seaters for the Austro-Hungarian Air Service. In stark contrast to their flying boats, these B and C class designs, spanning the years 1913 to 1917, proved mediocre performers and, in consequence, each variant was only built in small numbers. The 1915 Lohner B.VII, 17.00, seen here, despite its 160hp Austro-Daimler, could only achieve a top level speed of 85 mph at sea level. As in this case, despite their B class designations, many two seaters were retrospectively fitted with a gun in the rear seat, thus converting them, effectively, into C types. 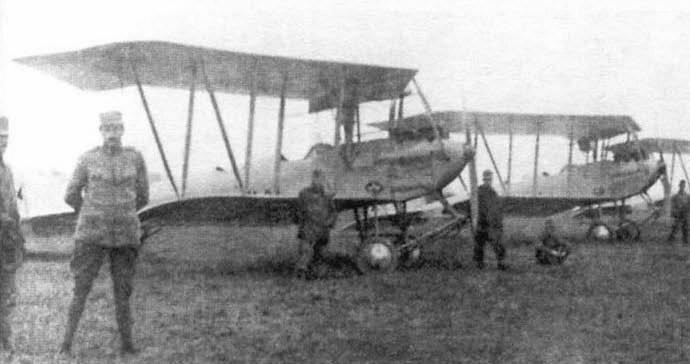 Lohner BVII of Fliegerkompanie 16 in autumn 1916: up to mid 1915 this had been an aircrew training unit but in May it moved to the Carinthian Front for operations, remaining operational as a general purpose' unit until the end of the war. In Austria, Lohner had become the army's sole supplier by 1913. This is a Lohner BII/Type C of the period.